As you may already know, the OCAD U Book Arts Fair has been discontinued, but good news! 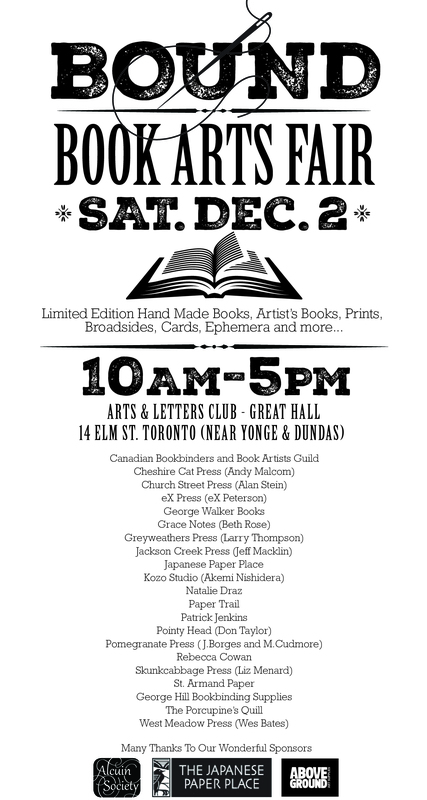 The Porcupine’s Quill will have a table at the new Bound Book Arts Fair in Toronto. 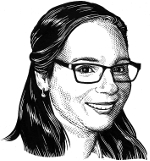 The following guest post by Chester Gryski, one of the organizers and a member of the Arts and Letters Club, will give you all the details you need to plan your visit! For 30 years, there has been a book arts fair in Toronto at this time of the year, where printers, binders, calligraphers, papermakers and others associated with the book arts have shown their wares and are available to discuss their work. Many thanks to Michelle Walker for stepping in to make this happen this year. This the perfect time and place for your shopping for books, broadsides, prints, cards and more. The Porcupines Quill will be there. 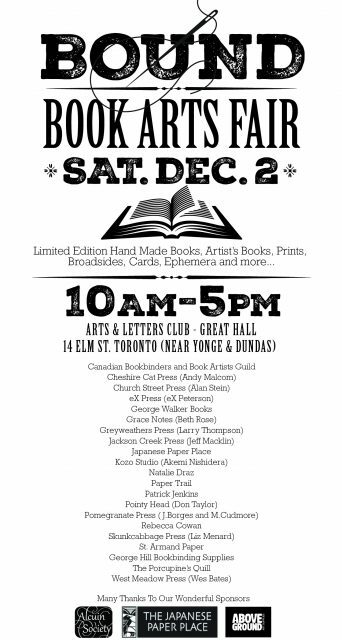 Among the over 20 participants you will find The Cheshire Cat Press, Church Street Press, George Walker Books, Greyweathers Press, Japanese Paper Place, St. Armand Paper, Canadian Bookbinders and Book Artists Guild, and George Hill Bookbinding Supplies. A full listing is on the broadside below. This entry was posted in Letters from the Porcupette (the Intern's Blog) and tagged Arts and Letters Club, book arts fair, Bound Book Arts Fair, events, Toronto events. Bookmark the permalink.